Forewarning: Tonight I purchased a ticket for Ruby Sparks fully prepared to hate it. I was not disappointed. I admit to having a thing for Paul Dano. I overlooked him the first time I saw Little Miss Sunshine, but There Will be Blood piqued my interest and now the color-blind Nietzsche fanboy is totally my cup of tea. I even sat through Meek’s Cutoff for him. He plays a yellow-livered coward in Cowboys & Aliens and more recently in Looper. Meek’s, Blood, and Cowboys were all westerns, and Looper is supposed to be a sort of reimagining of the western. I’m glad he’s getting roles, but I didn’t really like the idea of Paul Dano being typecast. So when Being Flynn was closely followed by Ruby Sparks, I was kind of worried. I haven’t liked a movie about “the writing life” since I graduated from college, so I get kind of annoyed with previews that portray writer’s block. 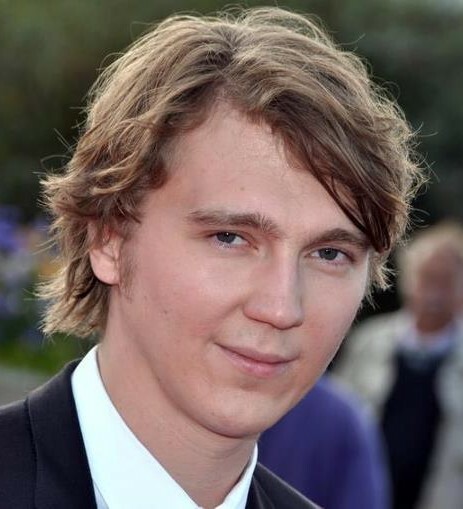 Paul Dano has that writerly look about him, but I would almost rather see him play supporting roles in westerns for the rest of his career than watch him stare winsomely at one more typewriter. Being Flynn just seemed like a write-through-the-pain father/son story, but Ruby Sparks looked borderline offensive. He can manipulate a woman’s behavior? A woman whose purple tights barely cover her lady bits when he picks her up and carries her caveman-style down the street? I missed you in bed last night. D’you get some good writing done? How… dumb. How thoroughly dumb. Finding out that his female co-star wrote the film did not help matters. To clarify: Zoe Kazan wrote a screenplay where a man creates the perfect woman, and she cast herself as that perfect woman. Yeah, I want to see a film about the writing life according to Zoe Kazan. This kind of reminds me of the kerfuffle about Lena Dunham when Girls premiered. People were annoyed that these privileged Gen Y-ers were essentially filming their lives and calling it art. Their defense was that someone can grow up rich and still have something meaningful to say, but I think what we’re getting at here is that normal people can’t get away with this. The rest of us go to public schools and get that sort of behavior beaten out of us by the other kids. We’re jealous, yeah, but it’s not of their money or their talent; it’s of their sheltered lives where this sort of thing is allowed, even praised. Did I forget to mention that Zoe Kazan has rich, well-connected parents? And grandparents? And she’s – sigh – dating Paul Dano? Over the past week, I did this whole thing where I read some Nick Flynn, then rented Being Flynn on iTunes, and finally dragged myself to the cinema to sit through Ruby Sparks (it opened later in Ireland than in the US, but it’s about to close here.) I treated it like an assignment, and boy did it feel like one. All three of these films were excrutiatingly painful to watch. I don’t know if I’m just getting old, but they felt so formulaic: Wallflower had a checklist of teen-angsty issues that had to be crammed into the plot, and I liked Liberal Arts better when it was released 10 years ago and starred Zach Braff. 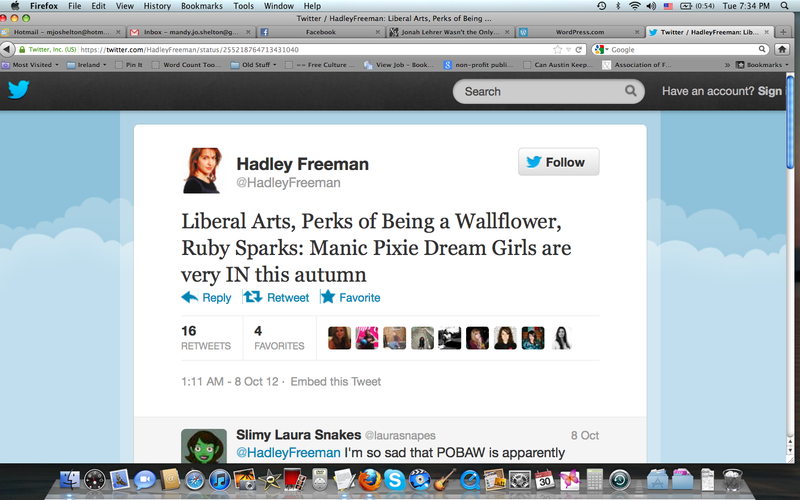 As for Ruby Sparks, well, the actress is a girl named Zooey Zoe, right? And by way of introduction, we see her riding a vintage bicycle rollerskating in sunlight while a voiceover describes her attributes and she’s from somewhere that’s not Los Angeles, like maybe Michigan Ohio and ohmygod we get a quick peek at her high school yearbook photo! Then there’s a scene where she and her love interest run around Ikea an arcade because they are just so twee and in love! But maybe he’s not seeing her clearly? Just like his sister brother cautioned? Conflict arises. And when it’s all over, he meets a new girl, but she’s kind of the same girl, because her name is the next season in the annual cycle purposefully left out of his latest novel. Hadley does this better than I ever could, but I needed to get it off my chest. I walked home upset that people get to create vanity projects like Ruby Sparks while some really good ideas go underfunded. Luckily, Paul Dano pretty much disappeared into his role, so in my eyes, he made it through this movie unscathed. This entry was posted in Book as Object and tagged film, Nick Flynn, Paul Dano, Ruby Sparks, writing by Mandy. Bookmark the permalink.